Ashley N. Ward-Singleton is a native of St. Petersburg, Florida. She attended Florida State University where she pursued a dual degree and received a Bachelor of Science and Communications and a Bachelor of Science in Marketing. 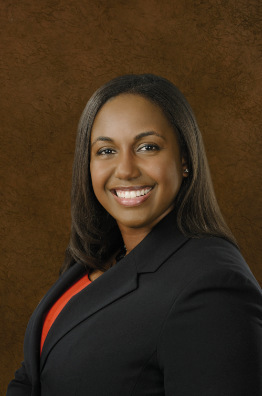 Upon graduation, Ashley moved back to St. Petersburg to be close to her family and to attend Stetson University College of Law to pursue her Master of Business Administration and Juris Doctorate. During her tenure at Stetson, Ashley competed with and served as an Associate Justice of Stetson’s award-winning Moot Court Board. She also worked as a Teaching Fellow for the Research and Writing Department and interned with Judge James Pierce in the Sixth Judicial Circuit. Additionally, Ashley participated in Stetson’s study abroad program to Tianjin, China. Before graduation, Ashley served as an intern for a large insurance defense firm in St. Petersburg, Florida, where she would later work as an associate for several years. She represented some of the largest insurance carriers in the country and handled every stage of litigation from drafting motions and discovery to deposing expert witnesses and conducting trials. During this time, Ashley also began litigating cases in federal court. Following this experience, Ashley pursued a Federal Judicial Clerkship with the Honorable United States Magistrate, Judge Carol Mirando in Fort Myers, Florida. This clerkship provided Ashley with exposure to a myriad of cases, but more importantly, made her intimately familiar with the Federal Rules of Civil Procedure. Following Ashley’s clerkship, she worked for a national employment law boutique defending an array of employment discrimination cases. Through these experiences, Ashley has become comfortable litigating cases in both state court and federal court. Ashley is licensed in all of the state and federal courts in Florida. She can handle both simple and complex legal issues. Ashley’s primary practice areas are personal injury and first-party property damage litigation. When Ashley is not acting as a lawyer in St. Petersburg, FL, she is actively involved in the community and is presently a member of the Leadership St. Pete Class of 2018. She also enjoys traveling and spending time with her family. Call Ashley Ward-Singleton’s Direct Line at (727) 315-0867 Today! Florida State University, Bachelor of Science in Communications & Marketing.